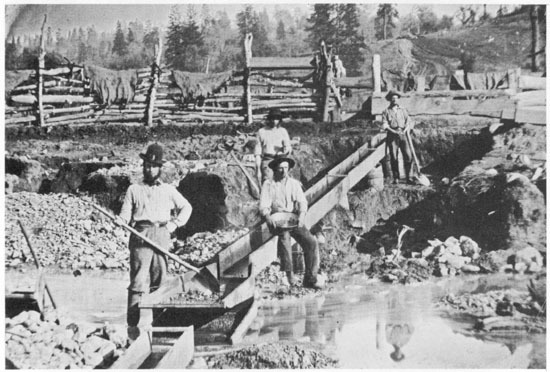 This is a photograph of gold miners in California, in the early 1850s, following the discovery of gold in that state in 1848. Much of the expertise that was employed in California came from miners who had previously worked the mines in the Southeastern U. S. Source: Bowers, Q. David. United States Gold Coins, An Illustrated History. Los Angeles, CA: Bowers and Ruddy Galleries, 1982, page 14. Earlier from a daguerreotype in the New York Public Library Picture Collection.